The Bravo P15 is a full size IR illuminator replica which is ideal for low-light room clearing and aimed fire without using an optic. Built in to the illuminator is a ~270 lumen LED flashlight with a wide beam for room clearing or indoor play which will not overwhelm when transition from a bright environment to an indoor low-light situation. 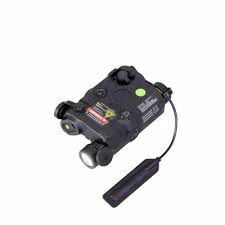 Additionally, a low power IR illuminator and a high output green laser designator are built into this model, and are fully adjustable by way to separate windage/elevation adjustment screws. Finally, a pressure pad input and top dial control the illuminator for momentary and constant "ON/OFF" function.